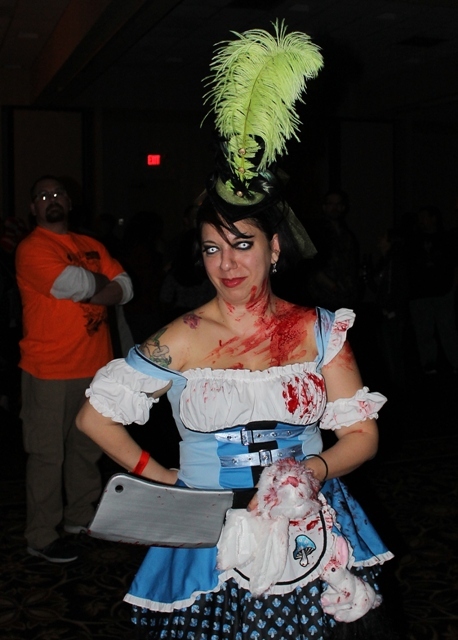 2013 Horrorhound Weekend Part 3: The Costume Contest! It was my friend, Russ Wrangler (not his real name but ideal for social media purposes), who’s always guaranteed to make me laugh. In most circles, I’d like to think I’m considered a funny guy but Russ has me beat, hands down! 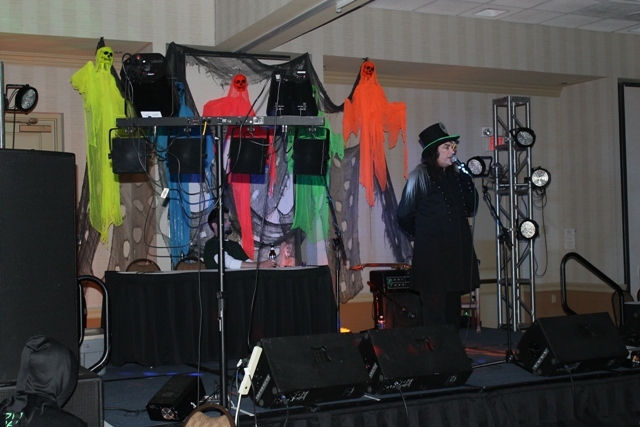 I remember at last year’s Horrorhound he had me laughing so hard, my voice was pretty much shot by the time I made it onstage the next day for the Horror Host Hall of Fame. With another speech slated at this event, I worried about history repeating itself…but not enough to prevent me from inviting Russ to join me. Needless to say, I never did see that movie as we opted for a late supper at the hotel restaurant instead. I suppose this is as good a time as any to mention that wonderful restaurant at The Crown Plaza. While the food was decent, the service was so incredibly BAD it was downright comical! You’d stand there waiting 20 minutes to be seated while there were plenty of empty tables and no less than five workers running around doing absolutely nothing. Russ would later quip that the time it took to be seated, served, and pay for our order was enough to create bed sores! During the course of this event, we also experienced them forgetting to place one person at the table’s order while serving the other (so they’d be finished eating by the time you started) and, on another occasion, bringing us identical food plates after we’d just finished eating the originals and were ready for our bill! Seriously, I’ve never seen anything quite like it! 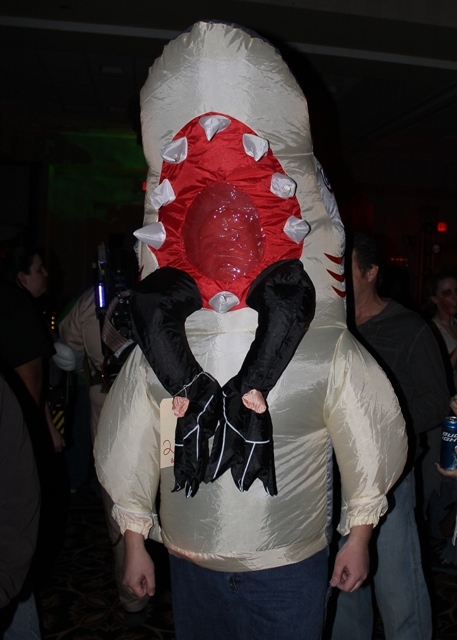 By the time we made it out, we’d just enough time to get to the costume contest. Earlier that evening I’d bumped into Eric Austin from The HMA and he gave me a hug and asked if I’d be willing to assist him by serving as a judge in the contest. I was really honored and readily agreed. 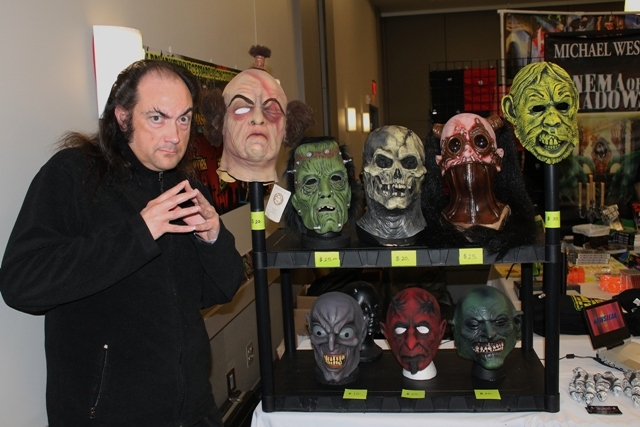 Eric Austin…the man behind the masks! 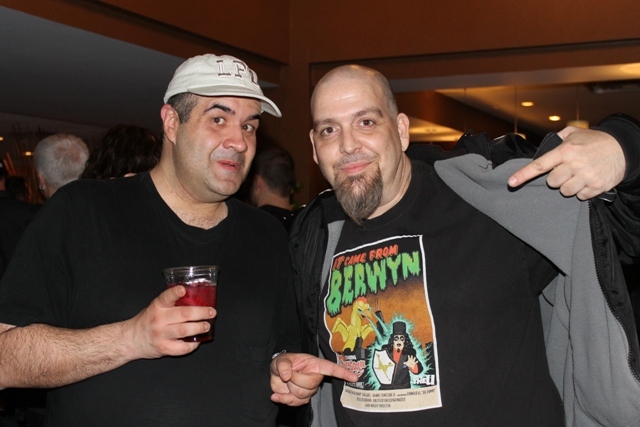 My ambitions were soon dashed, however, when a few moments later I met up with Ohio PA host, Dr. David Lady (who was slated to emcee the event), and he proudly mentioned they were going to have Bill Moseley along with Daniel Roebuck as judges. Clearly outclassed, I went back and reported the news to Eric while thanking him for considering me. The Nefarious Dr. David Lady! Russ and I dodged numerous horror fans before entering a large, dark room illuminated primarily by the main stage where Dr. Lady tried his best to announce contestants amid the intense noise. I had a lot of difficulty understanding what he was saying which was a damn shame in lieu of his quick-wit and how hilarious he was during last year’s contest (covered HERE). I also noticed Eric sitting all by himself beside two empty chairs. Apparently the other two judging hopefuls never made it so I could have served after all. 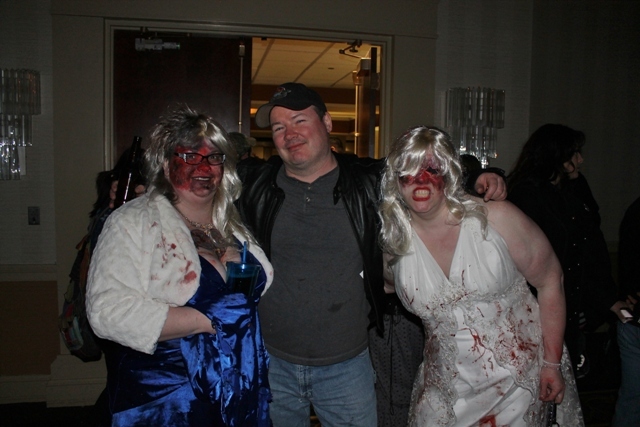 Though only a handful of horror hosts made it out to Horrorhound compared to previous years, Russ and I happily noticed Robyn Graves from Midnite Mausoleum hanging out with friends and clearly having a great time. 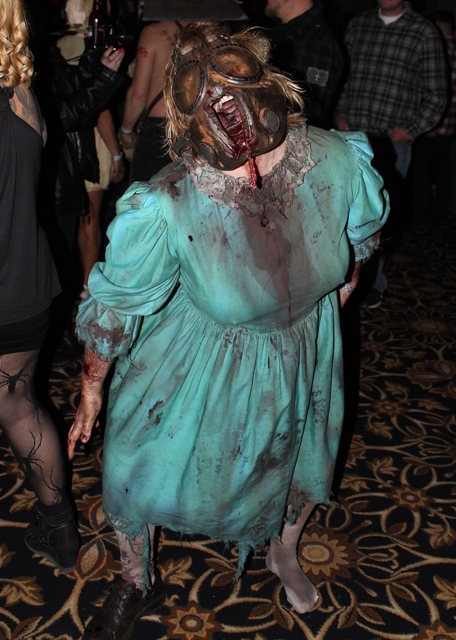 This appearance would garner her massive props among fans by not only proving that she’s one of us but also due to her choice of not using her horror host credentials to gain easy convention access; opting instead to wait in line like everyone else. 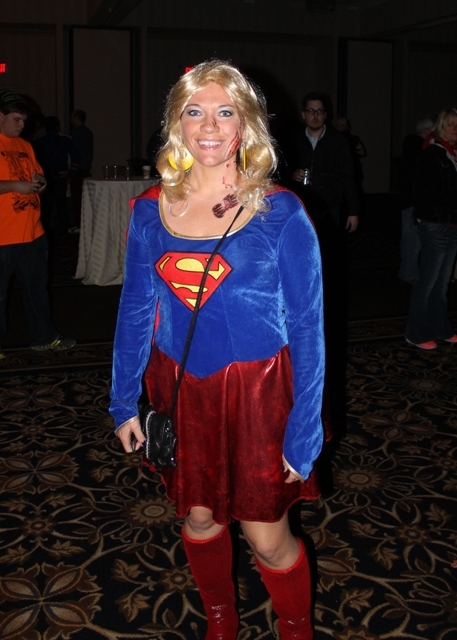 I’d last seen her at Days of the Dead in Chicago and, as with that event, she joked about her and I both appearing without our customary sidekicks. 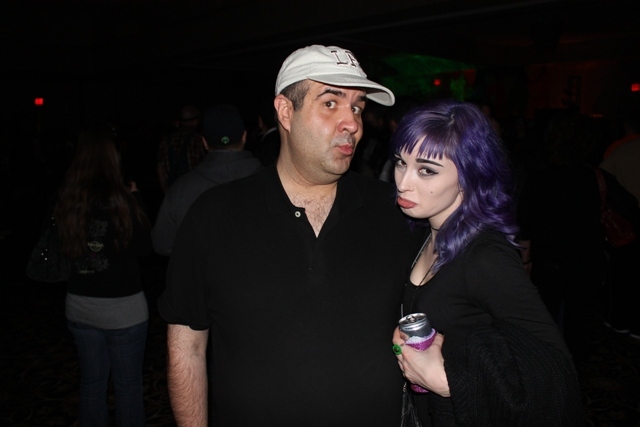 Terror Dave & Robyn Graves…being solo’s no reason to pout! 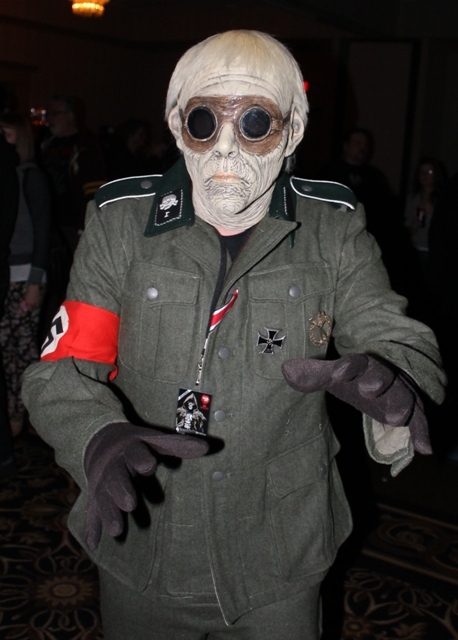 Russ and I navigated the dark room while I snapped photos of any ghoul my eyes were able to focus on. 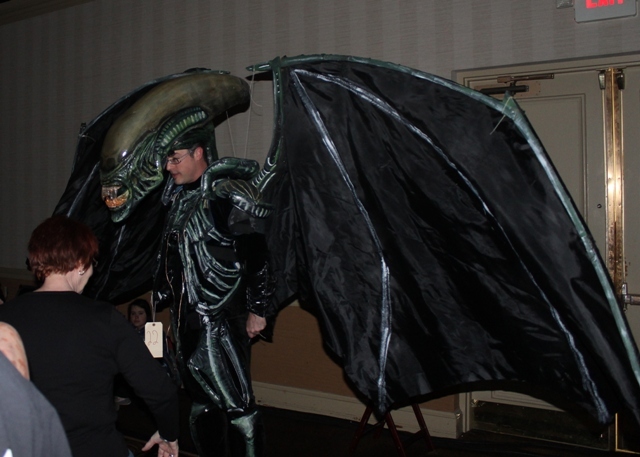 In some instances, this wasn’t too hard since a few actually wore costumes that “lit up.” One of these luminescent monsters was a huge Alien with wings that I thought was really amazing! 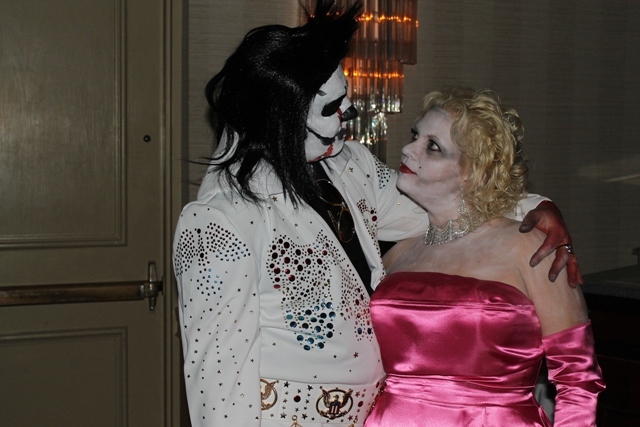 I immediately redirected his attention to a guy dressed up as Gene Simmons and he laughed, explaining how he’d planned on having someone tell me that was him. 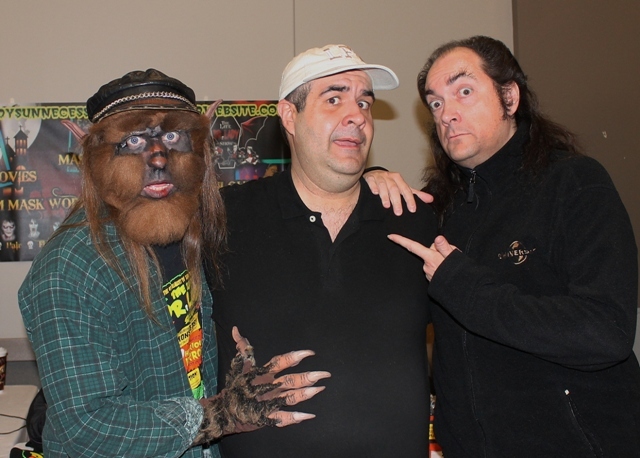 Prior to this trip, Dale had dressed up like the iconic member of KISS and I’d asked him to bring that costume to Horrorhound…which he refused to do. 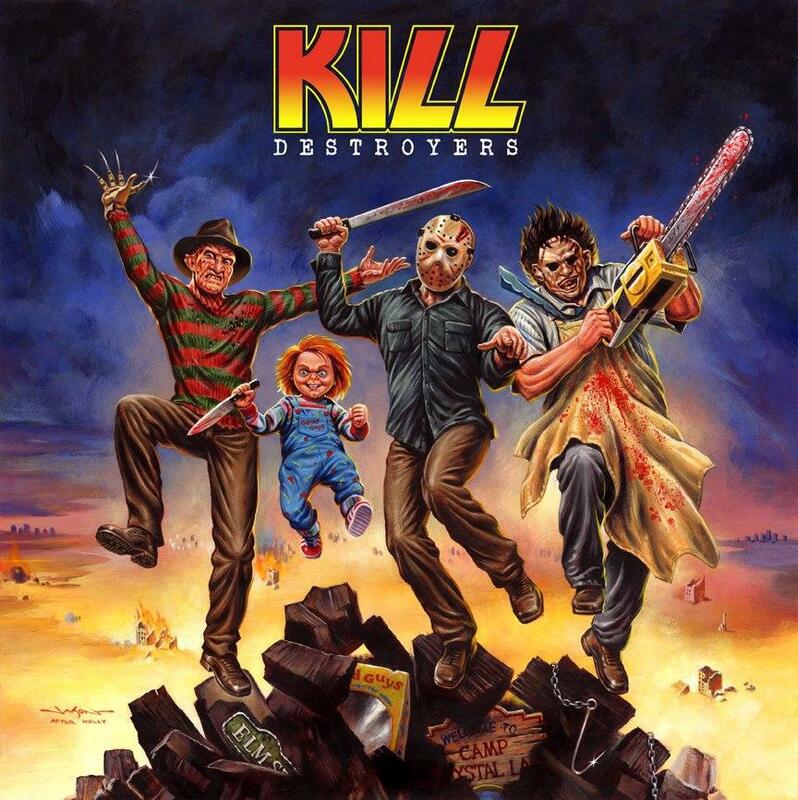 KISS and horror fans definitely go hand in hand as I saw numerous folks wearing T-shirts featuring a slasher mock-up of the Destroyer Album cover as well as some KISS gals I’ll be covering later. 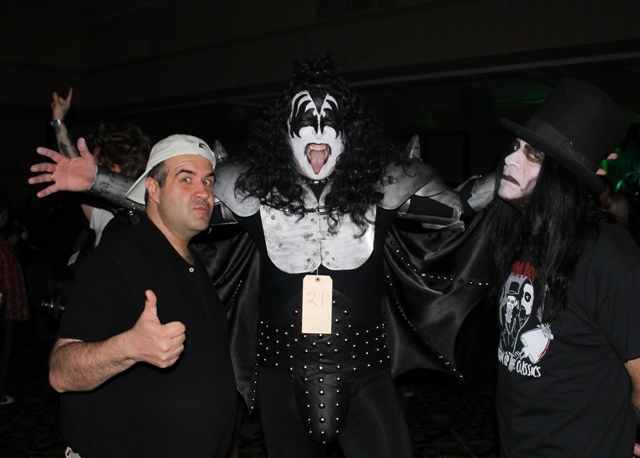 At this date I also have a special pass to meet the real Gene Simmons at the upcoming Fright Night Film Fest in Kentucky! Kings of The Night Time World! 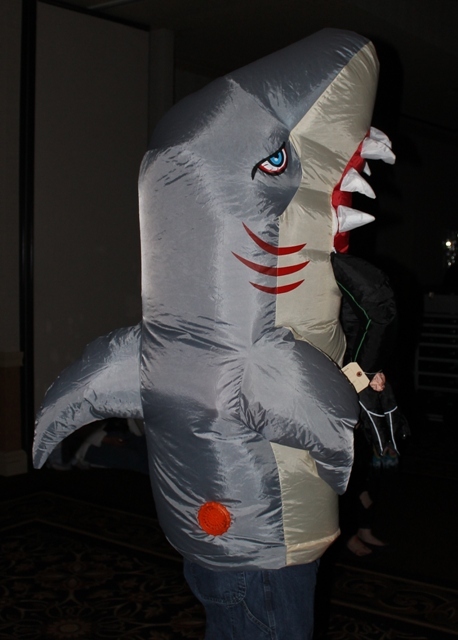 For those less skilled in the whole “convention thing,” the polite procedure for snapping these type of pics is to go up and demurely ask someone in costume if you can take their picture (which of course they’ll always say YES to). I approached one who created a fantastic rendition of “Darkness” from 1985’s Legend. 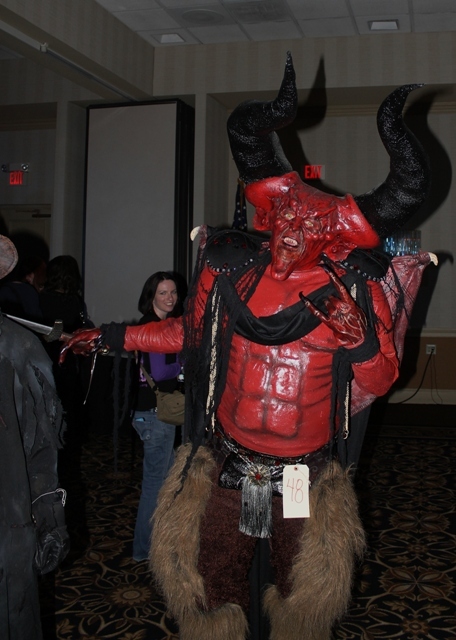 After asking if I could take his picture, I was shocked when he responded, “Well of course, Dave!” It turns out that underneath that red devil was none other than Indiana PA host, The Pumpkin Man (William Cowan), from Fright Night Theater! The next day he and I would have a nice chat while he was in his civilian clothes as, for some reason, I was immediately drawn to that shirt of his. I don’t usually see him out of his Pumpkin Man costume but both he and his wife, Angelica, are two of the nicest people you could ever meet. 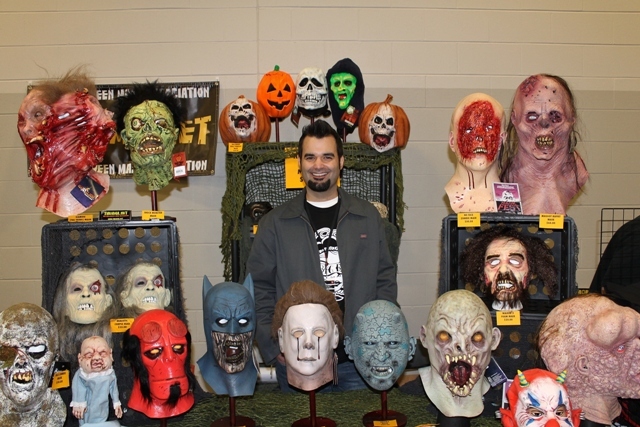 I encouraged him to attend The Nightmare on Chicago Street event this year and show off his costume (whichever one he chooses) and hope they’ll show up! 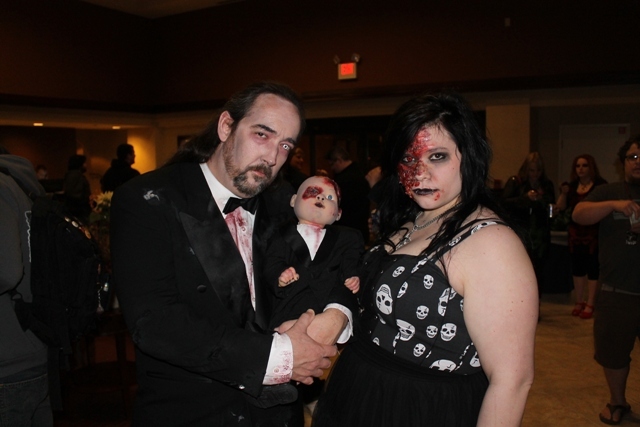 Terror Dave & William Cowan! 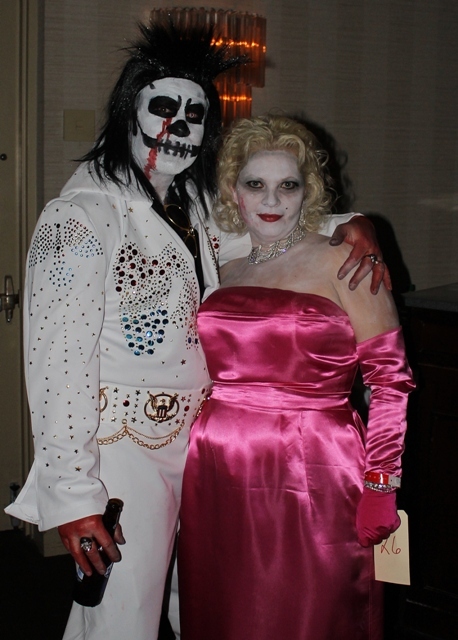 This entry was posted in Convention & Expos, Cosplay and tagged Darkness, Dr. David Lady, Elvis, GENE SIMMONS, Hellraiser, JAWS, KISS, LEGEND, Marilyn Monroe, Shock Waves, Supergirl, THE ROCKY HORROR PICTURE SHOW, Zombies. Bookmark the permalink. 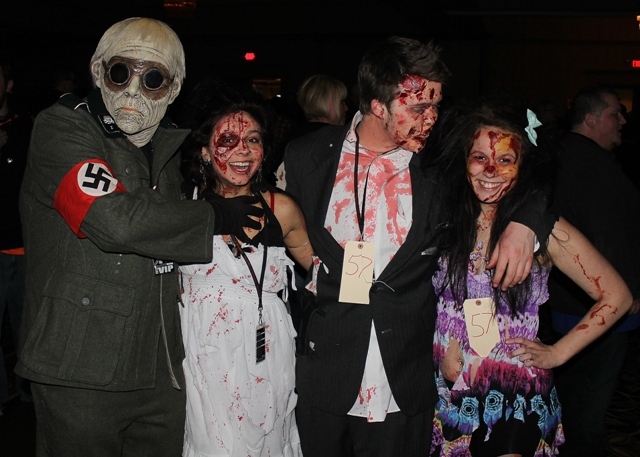 ← 2013 Horrorhound Weekend Part 2: The Costumes! 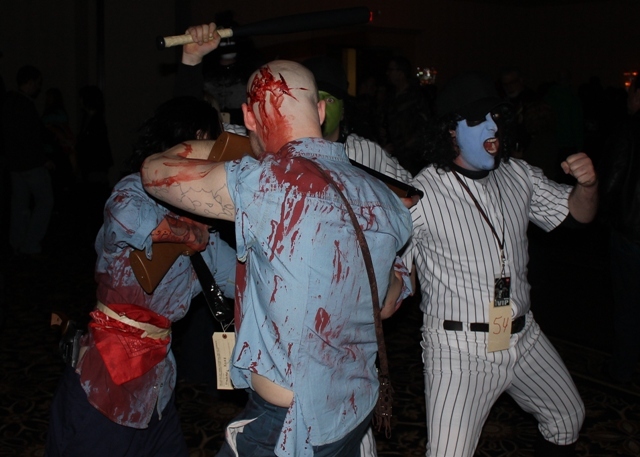 It must have been a blast to be around so many wonderful and creative costumed horror fans! We opted to sleep instead of going to the costume ball. Now I wish I had. 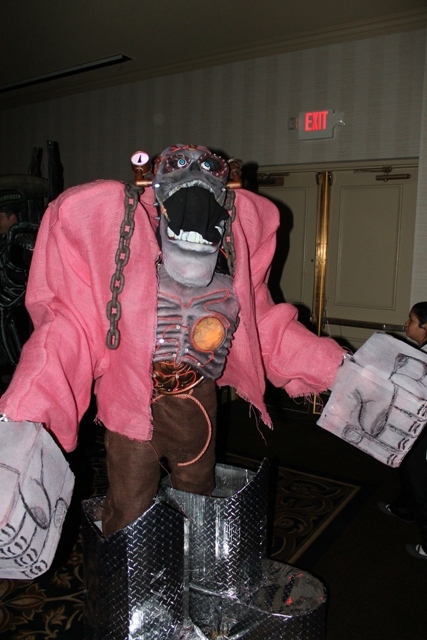 Darkness from Legend is one of my ALL time fave monsters and to know it was Pumpkin Man who donned the outfit makes it just that more awesome!! Thanks for the comment, Kayelle! That convention took a lot out of me too but I made it till Sunday evening before finally collapsing. LOL! Having fun reading your posts Dave, thanks.